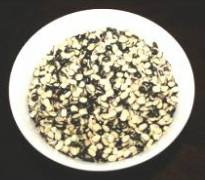 ﻿S﻿plit black Urad dal or Black grams are also known as Black chilka urad dal. These Black urad lentils have been split but not skinned and have creamy white interior. 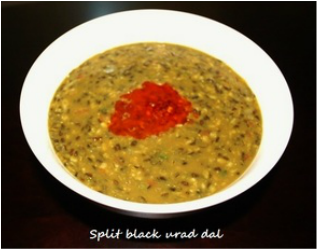 Black urad dal is very delicious in taste and easy and quick to prepare compare to whole black urad. 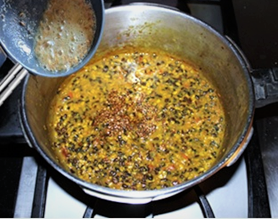 Split black lentils are not as mild as white urad, which have been split and skinned. Like other dals it is nutritious and high in protein. 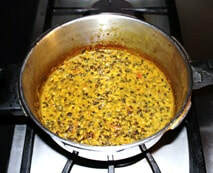 The addition of different kind of tadkas gives this dal a wonderful flavor. ​3. 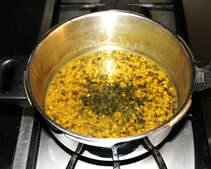 Add 4 cups of water,Turmeric powder, salt and 1 teaspoon of oil and mix. 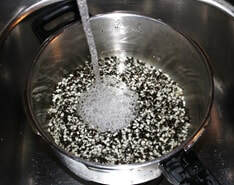 Pressure cooker to prevent that it is a good idea to add little oil. goes down. Different brand of cooker require different time to cook. ​ that it blend well. 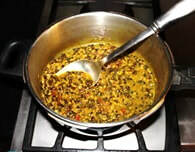 Tadka blend well and you have the desired constancy. 9. 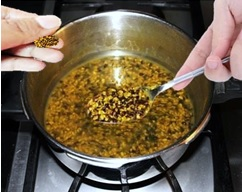 Add Cumin seed Tadka and mix cook for 1 minute and turn stove off. 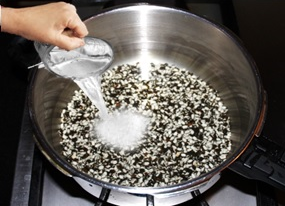 While dal is cooking prepare the onion tadka. 2. Add chopped tomatoes, grated ginger and chopped green chilies and cook. With the spatula try to mash the tomatoes so that they become soft quickly. In about 5 to 6 minutes tomatoes will become soft and blend with onions.